In October, Bettina decided to leave CoderDojo. After some intense years with CoderDojo, she decided it was time to invest more in her studies and family. What will CoderDojo look like in another 5 years? Bettina: (starts humming Daft Punk) Harder, better, faster, stronger. That’s the direction CoderDojo is headed. In Flanders and Brussels, CoderDojo is already widespread. Nevertheless, it remains crucial that CoderDojo Belgium keeps on providing a fertile environment for CoderDojos to grow. The expansion in Wallonia is also reaching a top speed thanks to the fantastic efforts of Valérie and Anita. Do you notice a change between now and the day you started working for CoderDojo? Bettina: Actually, I do. Kids that regularly attend a Dojo are really becoming more tech-savvy. If you just look at Coolest Projects (our yearly tech inventors fair), you’ll notice that the degree of difficulty of certain projects is just off the charts. Some of the participating kids have joined for two or three years in a row and you can just see how they evolved into young technological entrepreneurs. These are all kids that will be more resilient to the challenges of the future, even if they don’t desire to work in IT. I also witnessed how the community has grown over the last few years. Not only in size but more importantly in commitment. 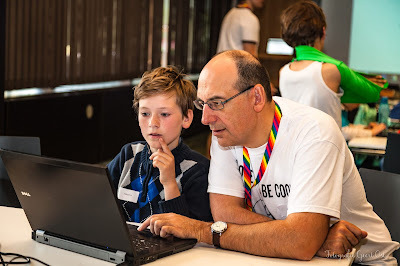 Since CoderDojo Belgium was founded, volunteers started all kinds of projects and events. We had volunteers organizing Coolest Projects Belgium and CoderDojo 4 Divas, contributing to the Coderdojo4All projects and all kinds of pop-ups. I am soo grateful for all these people that put in an effort and helped CoderDojo transform into the movement it is today. On the other hand, I enjoyed seeing the community come together. I believe Leads meet-ups, DojoCon and all these different events helped form a real community of people that know each other and help each other. I enjoyed spending time with all these amazing people and I will miss each and everyone of you. Thanks for everything you did for Coderdojo Belgium, Bettina. You will be missed! Nevertheless, we will keep calm and code on!